Blueberry muffins are a comfort food you do not need to go without if you are gluten-free. With this recipe you can enjoy the warm, soft goodness of fresh-baked muffins, popping with sweet-tart blueberries. If you don't have blueberries, substitute another berry such as raspberries, black raspberries, or mulberries. 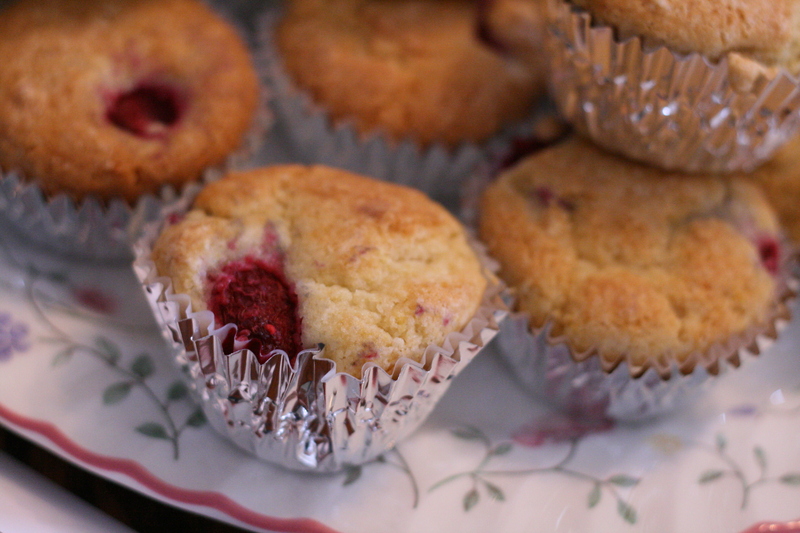 I chose to use raspberries for the muffins pictured below. Preheat oven to 350F. Mix together flours, baking soda, baking powder, xanthum gum, salt and sugar with a wire whisk. In a separate bowl, combine butter, egg, and buttermilk. Carefully mix dry ingredients into wet, being sure not to overmix. Fold in berries. Line a muffin tin with muffin cups and fill 2/3 full. Bake at 350F for 25 minutes or until done.